Not a straight damage boost per shot, but a stacking debuff that rewards aim and control. Works with any automatic weapon, present or future, vanilla or mod-added, no compatibility patches needed. I am a sorcerer. I'm going to make the code available as a modders' resource, as soon as I can clean it up and package it. If you want a look before then, ask me (I'll link it here when it's up). The .esp won't make much sense without it. If you make another weapon buff using this method, link to mah stuff! Adding Mod A to a weapon, then adding Mod B to Mod A, then removing Mod A, lets Mod B stay behind. I had no idea this was possible. I could do everything except preserve a Legendary weapon. In game, the whole dynamic function worked 100%; but if I used the ap_Legendary slot to do it, it would silently overwrite the Legendary effect. reddit.com/user/tim-timman let me know about this floating-mod trick. It winds up not working on Legendaries, but succeeds with everything else, and if he hadn't shown it to me, I would not have been looking down the path that led to the solution. 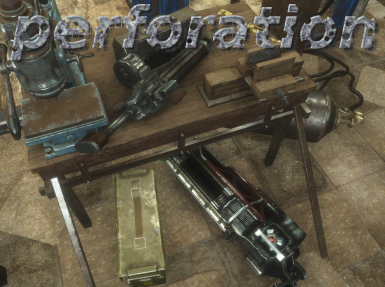 This mod makes no vanilla edits and does not alter the Commando perk (compatible with anything that does). Minigun feels sadly lacking? Commando and Heavy Weapons remain grey and lonely on your Perks screen? Not satisfied with simply raising the damage number? Landing your shots will reward you. Firing wildly will waste ammo. Lightly armored targets will dissolve. Harder targets can be brought down with sustained fire. Buff / debuff drops quickly when there are no hits. Oh yeah - and it also applies to the Gatling Laser and the Minigun. You're welcome. It takes less ammo to bring something down than a Vanilla automatic. Increased crowd control. Effective sustained fire. Don't change an equipped Legendary to or from Auto <-> Semi-Auto at a workbench; unequip it first. It may cause a freeze. This only affects Legendaries, and only when they're equipped as you activate the workbench. Every Legendary effect that Bethesda created, either in the base game or the DLC, should be protected. I have to explicitly list every known Legendary effect. THIS MEANS: if you mod in *new kinds* of Legendary effects, *they will be removed. * Your best option is to patch or edit my mod with that other mod's effect (I can tell you how if you need). There are several known issues and incompatibilities that may not be solvable, but they're very specific and won't affect most people. Check the bug reports section. Unique Uniques and More Uniques are safe. They do not use the Legendary slot, but add new normal mods (barrels, stock, etc). Quickslot favorite is preserved. If you have 323 weapons of the same base object in inventory, it still works. Item is equipped again. All actions are SILENT. No "removed" or "added" or 47 equip sounds. Legendary weapons stay legendary. The only side effect is: the first time after install you equip a Legendary automatic, there's a 1-3 second pause while it's scanned and modified. This happens only once, per weapon, per game. Normal equip speed after that. MOD AUTHORS: The source code can be found here. No need. It just works! The magic invisible weapon mod that makes this all happen is added in the game, when you equip any given automatic weapon for the first time. As long as it remains an automatic (even when you change which automatic receiver you're using), it keeps the mod. Dark Rituals were performed at midnight to bring you this power. reddit.com/user/tim-timman let me know details about the mod system, specifically an efficient way to add a custom mod, without which I would not have been looking down the path that led to the solution.